Roof top grease containment should be a big concern for every restaurant owner or general manager for several reasons. Grease on the roof is an additional fire hazard that could potential destroy you entire business. As part of your Grease Management Program, we will monitor your rooftop conditions from cleaning to cleaning. At the time of service, the condition of the roof will always be noted on the after service report. We will make recommendations on how to help prevent future accumulation of grease on the rooftop. There are many different types of grease containment units that we can purchase and install for you. Let us help you determine which unit works best for your faculties rooftop. The Grease Gutter is a great solution for up-blast fans that discharge grease from all four sides. The material used in the Grease Gutter is designed to absorb grease while allowing water to pass through. This system is attached below the up-blast fan to create a barrier between it and the rooftop. This makes it easy to visibly insure that grease does not reach the rooftop. As the pads become completely saturated with grease, they are changed out at the time of the Kitchen Exhaust Cleaning Service. It is weather resistant and will last for years. In contrast to the Grease Gutter, the Side Kick is a great solution for up-blast fans that only discharge grease from the drain spout. 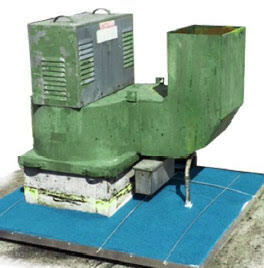 Replacement absorbent grease filter systems for roof mount grease containment products. Use the Roof Guardian in applications where a Grease Gutter won’t work. The Roof Guardian has a state of the art four layer grease filtration system to help keep your roof grease free. Available in all sizes to accommodate any brand of roof mounted ventilator grease containment systems. The Roof Guardian Grease Filter System can be used in any Grease Guard Roof Defence System. Omni Containment will honor the MFG warrenty when using Roof Guardian Filters.